The podcast started in 2015 as a way for me to explore an idea – namely that so much of the process of our daily engineering work is an art form. The public sees the end result of a public improvement, and our clients see the thousands of plan sheets they have paid for. Each of these is a respected medium of art - such as the “structural art” of buildings and bridges, and the obvious line on paper can be respected. But, what about our daily sketches and communication, where we work so hard to communicate ideas across disciplines and experience? Your word for “footer” is not mine for “caisson”, and your word for “ultimate” is not the same as mine for “factored.” We draw and write and sketch and even perform (in the case of proposal interviews or heated meetings), to communicate our ideas. But, I’m an engineer, so don’t take my word for it! I believe the best engineers are compelled to pour their heart and soul into their work. We hold in high esteem the value and integrity of work, to provide the public safe and reliable solutions. With so much of our being put into our work, art must be an inherent and natural component. So to find out more about the overlap of art and engineering, I went to the source. I started interviewing partners in engineering organizations such as ASCE Orange County Branch and the Transportation Research Board (TRB), as well as engineers and artists I respect and have been nice enough to indulge me. Topics so far have ranged from the engineering perspective of geotechnical, civil and bridge engineers, to promoting STEM and STEAM and engineering outreach in schools, to the academic experience with bridge researchers. And of course, the Art of Engineering podcast relies on the perspective of modern artists as well – such as Game of Thrones language designer David Peterson (Episode 5) and digital artist and comic illustrator David Malki (See Episode 10!). So our art – our daily work – is a balance of imagination, experience, communication and of ourselves. In these podcasts, I hope you will find there is really something for everyone, for those with even the slightest interest in engineering. My hope is the podcast reaches out to young people who maybe have never even heard of engineering – or sparks the interest of a future Robert Maillart or Albert Einstein. Indeed, episode 9 is on the topic of getting to Mars – and our future on the red planet! I have a lot of interesting ideas for future interviews, but one part of the podcast I really enjoy is posing “surprise questions” from listeners to the guests. I love questions from any age – from elementary school students to college age and beyond! Please send questions to [email protected]. One of my inspirations and my hope for a future guest would be that of Neil deGrasse Tyson – “Your personal astrophysicist” and host of StarTalk and the COSMOS series on ‘Fox’. I think the biggest lesson I have learned and best advice for other SEI chapters, is to combine your interests. I find that combining my passions and interests can yield really novel and engaging experiences, both for me as well as like-minded individuals. At Michael Baker International in Irvine, CA, also an SEI Elite Sustaining Organization Member, we are constantly tackling new challenges in bridge design and a variety of other structure types. And Baker is extraordinarily supportive of professional development and continuing education. This allows me to stay up to date on the latest research and state-of-the-art practice, such as involvement in TRB and SEI conferences and events – while fueling me with new ideas and topics I want to share with future engineers as part of engineering outreach efforts! I find the artistic diversions make me better at technical challenges, while the technical efforts provide me with new ideas for the podcast, local SEI activities and other hobbies. This is also the basis of the STEM and STEAM movement in education, which you’ll find is another passion of mine and (another) focus of the podcast. 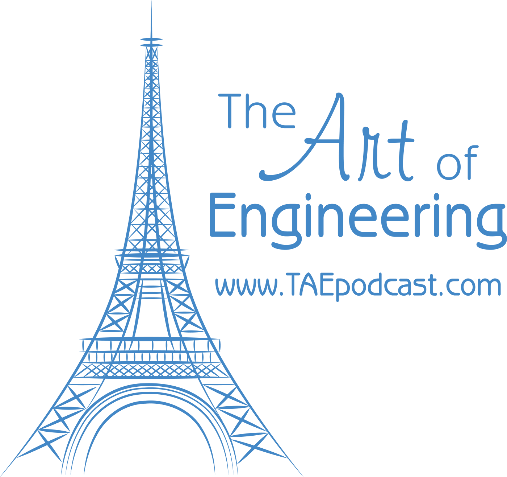 Listeners can learn more about “The Art of Engineering” podcast at www.TAEpodcast.com, or subscribe (free) directly from iTunes and Stitcher Radio.